The Tsing Ma Bridge, located in Hong Kong, is the world’s 9th longest suspension bridge. At the time of completion it was the actually the second longest. This bridge got its name from the two islands at both of its ends, Tsing Yi and Ma Wan. This bridge has two decks and carries rail and also road traffic. Bridge construction began in 1992 and ended in 1997. The opening ceremony was officially administered by former British Prime Minister Margret Thatcher. Tsing Ma Bridge was designed by Mott MacDonald. The main span is 4,518 feet long and its highest point is 675 feet tall. The bridge has a shipping clearance of 203 feet. The structural steel weighs 49,000 tons and the weight of deck sections is 1,000 tons. The 134 foot wide bridge has 6 lanes for automobile traffic; with 3 lanes in each direction. The lower level of this bridge contains 2 rail tracks. The lower deck has sheltered carriageways for maintenance access and also as a backup for traffic when severe typhoons strike the city. The Bridge forms a link between Tsing Yi Island and the Ma Wan Island over the Ma Wan Channel. This bridge is a very important gateway to Lantau Island. The bridge, highway and tunnel connections in this area are all part of Tsing Ma Area Control which is under Tsing Ma Control Ordinance and Hong Kong Law. 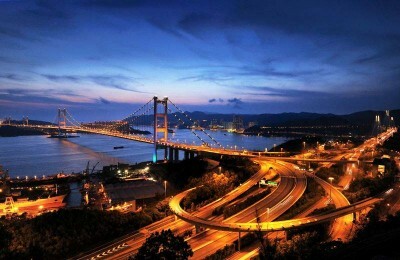 When using Tsing Ma Bridge, the speed limit is 50 miles per hour. The speed can be lowered in case of any road work or a strong wind. Parking is prohibited on this bride and there is not a sidewalk. Over the years this bridge has been a favorite landmark. Many people from all over the world have come all the way to Hong Kong to view this amazing structure. To get more information about the bridge, tourists can go to a visitor’s center located on the northwest corner of Tsing Yi Island. This center is open from 10:00 AM to 5:00 PM on weekdays, except for Wednesdays. On Saturdays, Sundays and public holidays the center is open from 10:00 AM to 6:30 PM.